Mushrooms are quite a sought out buy for marine aquariums. Their ease of handling and their ability to add significant display value to a reef aquarium make them a popular choice among hobbyists. But, interestingly enough mushrooms are neither corals nor anemones, they are intermediate organisms. However, as they are closer to corals, they are commonly considered as corals. Giant Cup Mushrooms are one such variety of mushrooms that are quite popular with the aquarists. This article throws some light on the various areas pertaining to Giant Cup Mushrooms vis-�-vis a marine aquarium. Other names: Giant Cup Mushrooms belong to the Phylum Cnidaria and their scientific name is Rhodactis indosinensis. Giant Cup Mushrooms are also commonly referred to as Giant Disc Anemone, Giant Coral Anemone, Giant Flower Coral and Giant Mushroom Anemone. Coral Type: Giant Cup Mushrooms are hard corals of polyp type. Size: Giant Cup Mushrooms may vary in size owing to various contingencies such as the depth of the marine water Rhodactis indosinensis is living in, the flow of water around Giant Cup Mushrooms, the surrounding marine atmosphere of Rhodactis indosinensis, etc. Color: Giant Cup Mushrooms occur in the color variations of tan, brown and green. Compatibility: Rhodactis indosinensis is semi-aggressive in comparison to the other marine aquarium invertebrates. Habit and Habitat: Giant Cup Mushrooms are the most rugged ones among the other members of the Phylum Cnidaria. 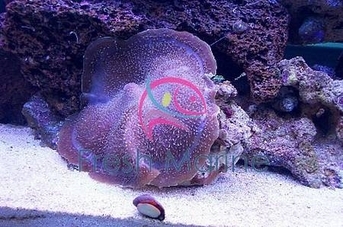 Breeding: Giant Cup Mushrooms breed easily and rapidly in marine aquariums. Rhodactis indosinensis reproduces asexually by the means of fission. Each resulting fragment is capable of growing into an independent Giant Cup Mushroom. Temperature: A temperature range of 72 to 78 degrees Fahrenheit is ideal for Giant Cup Mushrooms. Specific gravity: The specific gravity of the water in your marine aquarium with Rhodactis indosinensis in it should be maintained between 1.023 and 1.025.
pH: The pH value of your tank water vis-�-vis Giant Cup Mushrooms should read 8.10 to 8.40. Illumination: Giant Cup Mushrooms require low illumination. Water flow in the aquarium: Rhodactis indosinensis needs a low flow of water in the tank. Marine aquarium habit & habitat: Give enough space to Rhodactis indosinensis to spread itself well. Giant Cup Mushroom does not secrete toxins therefore; they are easy to handle without any apprehensions. Feeding: Giant Cup Mushrooms mainly derive their nutrition from photosynthesis. Rhodactis indosinensis is photosynthetic owing to its symbiotic arrangement with the photosynthetic alga, zooxanthellae. The alga lives within the Giant Cup Mushrooms. Rhodactis indosinensis may also feed upon meaty bits and miniscule marine plankton of the types, phytoplankton and zooplankton. Don�t forget to add Iodine in your marine aquarium water as a supplement nutrient. Care: Giant Cup Mushrooms are easy to maintain. The care task becomes easier as Rhodactis indosinensis is non-poisonous in nature. Caution: Giant Cup Mushrooms are aggressive towards some marine invertebrates and therefore, give ample space to them in your marine aquarium, so that they can expand without getting irritated.